"This cable or accessory is not certified and may not work reliably with this iPhone." Testers can simply dismiss the warning, and the Lightning cable, if functional, will still work as expected. AppleInsider was first to reveal last September that Apple's new Lightning connector features embedded authentication chips. That meant unauthorized third-party accessory makers had to spend more time reverse engineering Apple's official Lightning cables before non-certified accessories could hit the market. 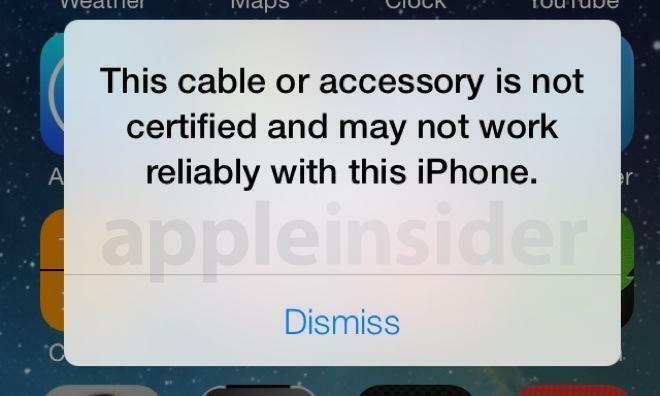 Apple has displayed similar warning messages in the past to iOS device users who plug in legacy unauthorized 30-pin connection cables. But the new warning in the first beta of iOS 7 marks the first time such a message has been associated with the new Lightning connector.